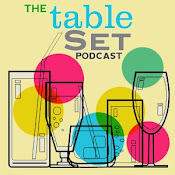 The Chocolate of Meats: Recettes Secrètes: Beet Cake! I wanted to bake my best friend a special and unique cake for his birthday. 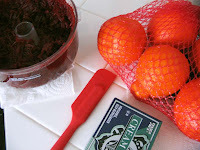 When I heard about curious beet cake, I thought "I have no idea how that will turn out but YES that's IT!" I was not disappointed! For lovers of carrot cake and zuccini bread - but slightly more sublime, and accessible for straight cake-lovers and well. 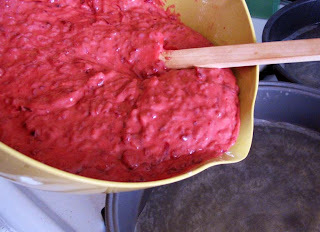 The beets add moisture and depth of flavor (though not the expected red hue - that bakes out into a mellow gold color). 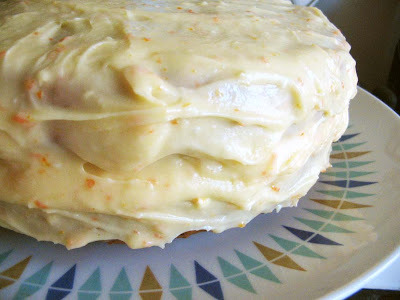 Beware: the orange zest flecked cream cheese frosting is good enough to eat with a spoon! 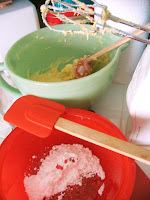 To prepare cake, peel beets using a vegetable peeler. Grate beets, using the large holes of a grater (I used my food processor with grate blade), to measure 2 cups. 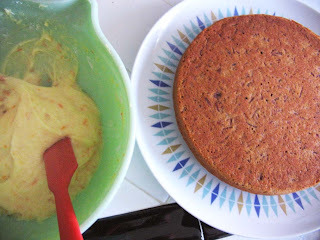 Coat 2 (9-inch) round cake pans with cooking spray; line bottoms with wax paper. Coat wax paper with cooking spray. Combine the granulated sugar, brown sugar, oil, and eggs in a large bowl; beat with a mixer at medium speed until well-blended. Add beets; beat well. Lightly spoon the flour into dry measuring cups; level with a knife. Combine flour and next 5 ingredients (flour through salt) in a large bowl, stirring well with a whisk. Add flour mixture to sugar mixture alternately with milk, beginning and ending with flour mixture. Pour batter into prepared pans; sharply tap pans once on counter to remove air bubbles. Bake at 350° for 30 minutes or until a wooden pick inserted in center comes out clean. Cool in pans 10 minutes on wire racks; remove from pans. Carefully peel off wax paper, and cool cake completely on wire racks. 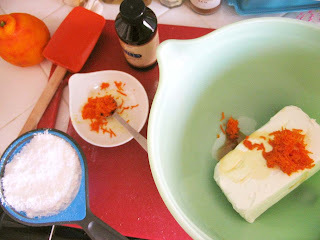 To prepare frosting, beat orange rind, vanilla, and cream cheese with a mixer at high speed until fluffy. Add the powdered sugar; beat at low speed just until blended (do not overbeat). 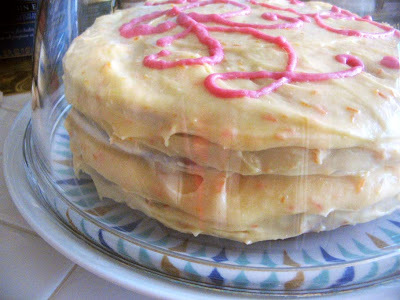 Place 1 cake layer on a plate; spread with 1/2 cup frosting; top with remaining cake layer. Spread remaining frosting over top and sides of cake. Sprinkle nuts over top of cake if desired. Store cake loosely covered in refrigerator. Mix together the sugar, butter, and salt. Add the vanilla. 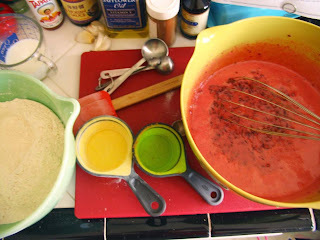 Then beat in the beet juice, adding a little at a time, until desired color and consistency is reached. Decorate, display and serve proudly! Could you live near me in NJ and bake me weird cakes like this too? It looks awesome.